The Internet of Things is the literal connection of devices above and beyond the standard end user device, the laptop, PC, tablet, and smart phone. Nest is riding the first real commercial company in his space that has recently been bought by Google. 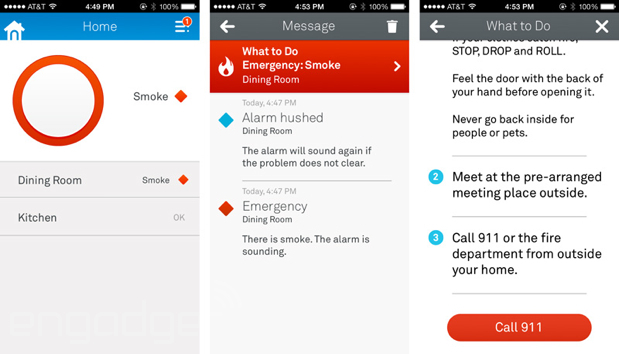 They have two products so far, an intelligent thermostat device, and a wireless smoke and Carbon Monoxide detector. 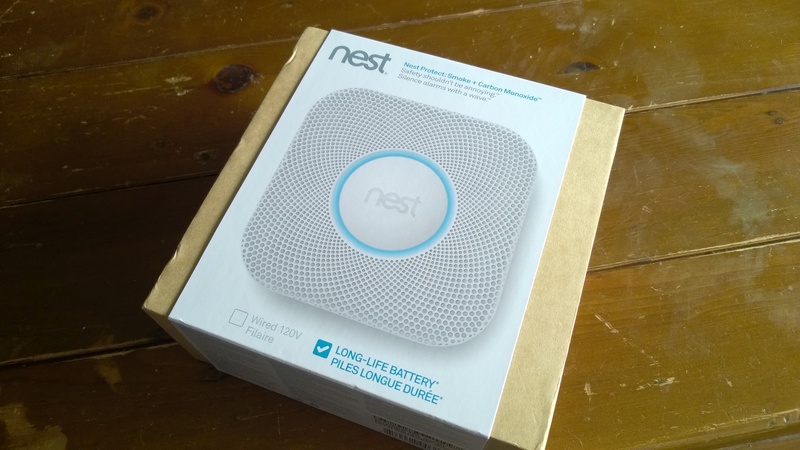 I bought a Nest Smoke and Carbon Monoxide alarm off Ebay. Unfortunately no one ships direct to New Zealand yet so Ebay is going to be your easiest option. Now, it cost approximately $150 NZD, but for that you get quite a lot. The alarm attaches itself to your wireless network and your smartphone or tablet. When it detects issues, it first warns that something may be going on (yellow) and then that there is a major problem (red). So in effect, it is a monitored alarm. You’ll pay dearly for that service if you choose to buy it online, so as long as you are comfortable with it utilising your internet connection, then great. I’ve been experimenting with various home automation systems over the past few months. We have a sideline business in the pet industry and one of the things that worries pet owners is that if they leave them at home, and something goes wrong, then the pet is trapped. Rather than paying for very high end monitoring systems, there are a number of devices out there now that do the same thing, probably smarter, definitely cheaper, and with more functionality. So a monitored smoke alarm is attractive. The Nest installation was super simple. It’s a little bigger than a standard smoke alarm and the steps to set it up take about fifteen minutes including screwing it to the ceiling. The battery tab gets pulled out and Nest comes to life, it tests itself, and talks to you while its doing it (yes, talks to you), and then you download the App from either Google or Apple, connect the device to your network and so the Internet. That easy. 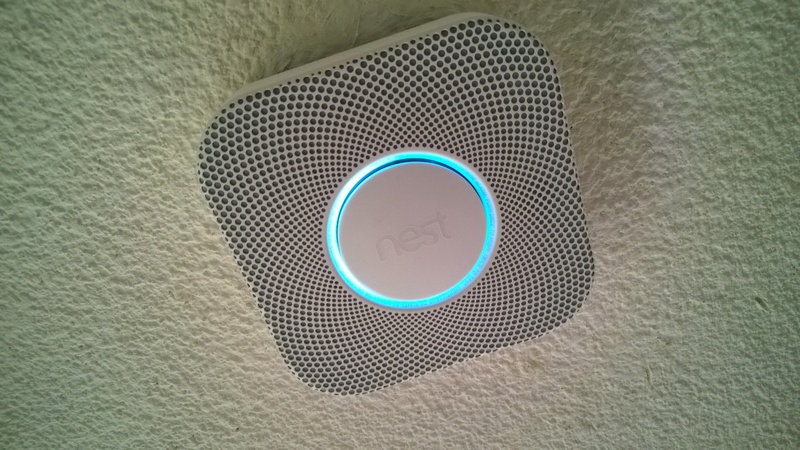 You can add multiple Nest alarms throughout your house and zone them. They sit there and jabber to each other about what is going on when you have more than two. Nest has a couple of other features that are designed to make you feel all comfortable. When you switch off the lights at night, it gives you a little green glow to show that “Everything is OK” (It actually says that when testing) and that its battery is charged. Get a yellow glow, and it’s time to change the battery. It also has some kind of proximity alert, so you can set them up to give you low light at night. As you walk down the hall and into the lounge it lights up and gives you something to navigate by. I don’t think that the Carbon Monoxide will ever be an issue here, or what the thresholds are, but those of you that live in high pollution zones, it may make sense. Overall, this is very cool product. Having the piece of mind that if something goes wrong, you’ll be the first to know, for the price of $150, is pretty good value. One of the only downsides is that there is no Windows App as yet, something they need to sort out.